We believe in giving back to our community. That’s why, in 2006, we established the Good Neighbor Program to formalize our long-standing commitment to partner with organizations in communities where we operate hotels. Through our Good Neighbor Program, our team members volunteer their time and talent to help their local community. We donate funds, collect furniture and fixtures from renovations, and provide partially used amenities to local shelters. We recognize the value of hotels in our communities and believe that giving back is, quite simply, the right thing to do. 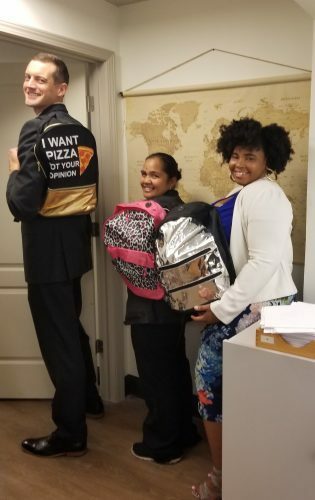 Photo Features: Walker Swan (Assistant General Manager), Saran Lucio (Room Attendant) and Sharidan McCorkle (Human Resources Assistant) helping to donate backpacks for back to school children in the Kansas City Area.